The Autumn colored leaves amongst the flow of the Restoule River in Restoule, Ontario in Canada can be watched for hours as the leaves make their way over each small waterfall. This waterfall may be a small one along the Restoule River in the town of Restoule, Ontario in Canada but it is beautiful as the Autumn leaves scatter themselves across the landscape. Many leaves get washed downstream as the water cascades over the boulders while others remain stuck to the rocks on either side of the waterfall. About 40 kilometers in length, the Restoule River can run at a good speed after the winter runoff begins. Many canoe down the river, but even during its fastest flow, canoeists may have to disembark and carry their canoes and equipment to the next appropriate place where the water increases in height. Autumn is one of the prettiest times of year to visit the Restoule River as the trees are full of vibrant colors. As the leaves on the trees drop one by one into the river, some make it over the small waterfalls while others lay to rest on the banks. 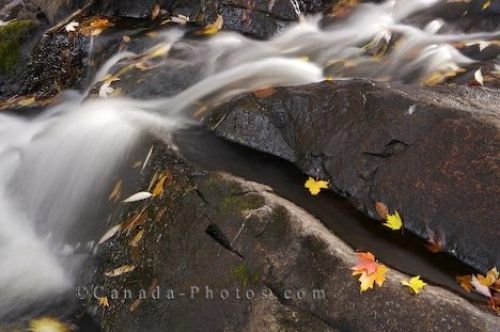 Picture of a small waterfall along the Restoule River in Ontario, Canada during the Autumn when the leaves are falling. Waterfall along the Restoule River in the town of Restoule, Ontario, Canada.